My first time in a Michelin restaurant! I caught up with a friend in Akihabara, Tokyo. It was my first time to that part of Tokyo (actually, my 4th time to Tokyo). We were both tired and needed to sit down and eat. It was nearing 6pm, which means that restaurants were quickly filling up, and queues typically form moments after 6pm. So, we said, “Ok, let’s just go into this pork-cutlet place”. It was a little expensive for such a restaurant, but Japanese food is much, much, much cheaper than my English and Australian dining experiences. We placed our orders for not the best, but a good crumbed pork-cutlet. While waiting I spotted a sign by the cash register that said that this is a Michelin rated restaurant. Jaw-dropped I stammer the news to my friend. The food… the food… was amazing. It was the juiciest, softest, and most succulent pork-cutlet I’ve ever devoured. The staff were not young, cute, pretty, handsome people many Nagoya restaurants prefer. Instead, they were older, meticulous, methodical, and clockwork synchonicity as they silently worked around. The restaurant itself was tiny, but nobody bumped into each other, such is their expert character. My first time in a Michelin restaurant! Update to the JapanesePhotos Instagram at: http://bit.ly/2ua0eN6. Another throwback. This time Allyce from 2015. Update to the JapanesePhotos Instagram at: http://bit.ly/2uKNhpO. Ramen kitchen Update to the JapanesePhotos Instagram at: http://bit.ly/2pZvxnK. Oh Ratatta! My Handsome Burger! ? Oh Ratatta! My Handsome Burger! ? Update to the JapanesePhotos Instagram at: http://bit.ly/2dcNITH. Handsome Burger is at Fushimi in the shopping arcade best accessed through the ticket gates at one end of platform 1 on the Higashiyama Line part of the station. These hamburgers are sooooo good. One of the most well known foods in Japan is ramen (Wikipedia), however, it’s actually a Chinese food. 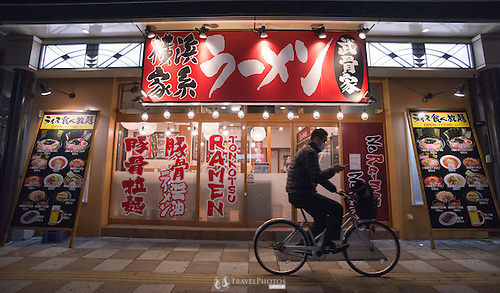 There’s a few different kinds, and it’s a delicacy that each ramen restaurant (or franchise) wants to be distinguished from the competition. That is to say, each restaurant will have slightly different styles and tastes, but are generally quite similar. One restaurant I went to, the noodles were quite eggy in flavour, others not at all. Because it’s also a dish that Japanese people have very particular tastes for, there are options that you can request when ordering. You don’t just say “ramen”, and a bowl of it magically appears, there are questions. Of all the places I’ve seen, this place featured below is definitely the most visitor friendly with English info. 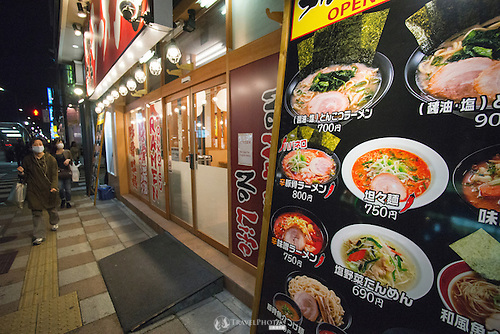 So, here are 5 things about ordering and enjoying ramen in Japan. 1. Street displays. Most places will show pictures of their products outside to lure you in. Here you can get a sense of what you want and the prices, and can compare to other nearby restaurants. As you can see, you can expect to pay between 690 to 900 yen (USD$6-10) for a hearty, healthy, and great tasting meal. 2. Ordering. Many places now have a machine that you put money in, push buttons, and get tickets. You give the ticket to the staff member. Often they’ll ask you these questions you see in the picture below. It’s quite ok to say in English “regular”, “medium”, or “normal” or in Japanese “futsu” or “zembu futsu” for ‘everything normal’. I recommend keep all communication simple and to single words, so there’s little chance of confusion. Once you start using English sentences, communication quality drops. Single words for simple communication. 3. What’s in it? It’s basically a soup broth, either fish, miso, or pork broths, Chinese wheat noodles, a slice of pork, sheets of seaweed, maybe half a boiled egg, and some vegetable matter. This one pictured below also includes a local type of spinach, and spring onions. The varying flavour between restaurants is usually down to the broth and the secret ingredients they use. 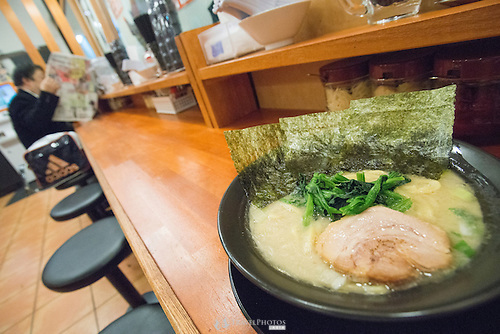 This one below is a common pork and pork-broth ramen, with some spring onions, local spinach, and seaweed. It’s actually my favourite. 4. What to do. Actually, this picture below has pretty good advice. Once you get it, try it, and you can adjust it with condiments and seasonings that are usually on the bench near you. I usually like to add some diced spring onions, or a small spoon of mashed garlic, depending on how I feel that day. The particular restaurant I went to gives some rice for free that you can add to your noodle soup. You’d need the Chinese soup spoon to scoop it up. I never do, as it’s already a lot of carbohydrates, but it’s additional energy that weary travelers might actually need. 5. How to eat. I eat it in the same way Korean ladies do, just because it’s easier, I look less of a fool, and perhaps less sloppy. Step one, use the chopsticks to load about a mouthful of noodles onto the small Chinese spoon (like the one shown below). Step two, once you’ve got a manageable amount on the spoon, then it’s easier to pick up the noodles as a bunch with the chopsticks and transfer the load to your mouth. Step three, repeat for each mouthful. Once you’ve finished, you can use the spoon to drink up the soup one scoop at a time. It may be a little salty though, so you don’t need to drink much, some people do finish it. Most places provide courtesy jugs of water, so you can wash the salt of your tongue or re-hydrate after a long day in the summer heat. Jugs are replaceable by the staff, so don’t worry about emptying the shops supply or the local lake. Also, there are tissues provided so you can wipe your mouth and the the surrounding bench of splashes. The picture below also shows below the shelf the other condiments you can add to your ramen. Don’t add them all, just open and sniff and figure out what might be to your liking. As you can see, I was thirsty from a long day travelling and photographing, so the jug is almost empty. Bonus advice. 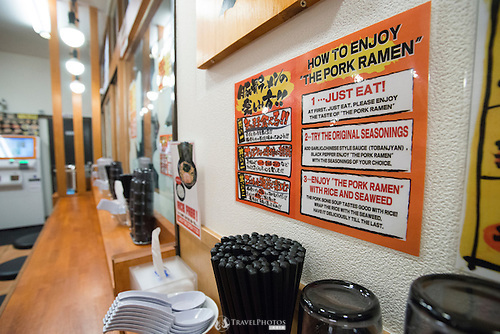 Never settle on a “favourite way” to enjoy ramen in your first few visits. Try a variety of different flavours and combinations of condiments, at least until you can settle on something you are in love with. 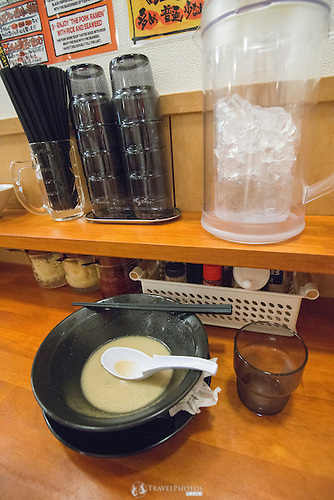 There’s some simple things that you to know about in a real Japanese sushi restaurant. There’s of course a lot more you can learn if visit with a sushi aficionado, but let your orientation to Sushi Restauranting 101 begin here. 1. When you first sit down. Step into the door and look for a young shop assistant who’ll ask how many people you’re dining with, and then he or she will direct you to a place to sit. Near your place is the hot water dispenser for your green tea. Usually at each section along the conveyor are tins with green tea powder. Just put one heaped spoon in your cup and add water. Place the cup against the large round button, and push. Of course refills are allowed. 2. What to do. You’re free to take any plate you like from the conveyor, but once you take the plate etiquette is you keep it. Even if you don’t eat it all, never put a half consumed plate back. 3. Plates are colour-coded. Each plate pattern equals a certain amount of money. There’s usually a chart somewhere on the walls that shows you the value of each plate design. Keep your own plates and never trade with other people, and never put them back on the conveyor. When your finished dining, tell one of the young waiters that you want the bill, “okaike kudasai”, and he or she will tot up the bill based on the number and types of plates you’ve stacked up. Typically plates cost from about ¥220 to about ¥650, and you’d have about six plates to a meal. I’ve never paid more than ¥1,500 for a good meal that gives me lots of energy for the next day. 4. Ordering plates. Yes, even if what you want to try isn’t currently doing the rounds, you can order from the menu. Usually on quiet evenings they don’t put out their whole menu, as it’d be wasted at the end of the night. The menu almost always includes a range of tuna, salmon, octopus, squid, salmon roe, shrimp, and egg servings. Usually sake, beer, and Japanese style deserts are available. 5. This little plate is for your soy and wasabi. It’s not the usual soy sauce, but one that’s especially formulated for sushi. Pour some onto your little dish. Add a small dab of wasabi on the side, and stab at it and mix it into the soy sauce. Gently dab the rice part of your sushi into the soy and then put the whole lot into your mouth in one go. But be aware that usually there’s already a dab of wasabi between the rice and the meat. Oh, and in case you didn’t know, wasabi is hot, and in large quantities it has the magical powers of sinus clearing. So be conservative at first on how much wasabi you add to your little dish. Bonus. Finally, if you’re unsure about something, do what I do. Just stop and watch what other people are doing. In all my travels, for any new experience, it’s almost always better to be chaperoned by a local who can give you a little guidance, inside info, and interesting personal accounts of something. In short, it’s more fun with friends, especially if they’re locals. Enjoy. Japanese restaurants are a dime a dozen. Japan has a reputation of being a very expensive place to live, especially with $100 watermelons! However, the Yoshinoya restaurant chain makes it possible for you to get a bowl of rice and beef or pork and walk away full for about $4. A typical meal out with friends, at a nice restaurant, good clean décor and premises, style, and great menu options, can cost under $20, and that’s without skimping. Here is a great model I had the pleasure to work with, Allyce, who’s leaving a restaurant. The curtains across the entrance indicates the place is open for business. A young lady travelling in Japan leaving a restaurant in the evening. This Photo of the Week (POTW) is for Valentines Day. Japan picked up the European day, and so it’s a time when young couples have another excuse to hang out and go shopping together. Here, in this model released photo, is a young Japanese lady waiting on the bench outside of a restaurant. Many popular restaurants have such seating for customers, as Japanese people are patient enough to wait for a table to be available at a restaurant with a good reputation, and of course Valentines Day is sure to make people wait longer, or line up earlier. This, and other images like it, are available on my PhotoShelter portfolio.